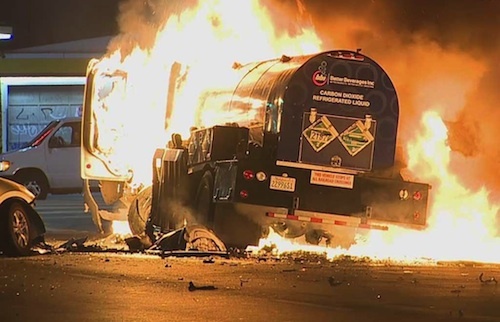 Just when things couldn’t get any hotter than the triple digit temperatures that hit Los Angeles over the weekend, a head-on collision between a car and a tanker truck hauling carbon dioxide resulted in a massive fiery explosion downtown. The accident left one person in critical condition and caused fire damage to a nearby building. The accident occurred Monday morning about 3:30 a.m. in the 1500 block of South Central Avenue, near the 10 Freeway. The preliminary investigation has so far revealed that a man in his 20’s was driving a silver Honda Accord about 70 mph the wrong way down East 16th street. The Honda then struck a dip, lost control and went airborne before barreling into an oncoming tanker truck carrying carbon dioxide. According to investigators, the 61-year-old truck driver had seen the car speeding towards him and tried to swerve to avoid being hit but it was too late. The impact immediately caused the tanker to burst into flames but thankfully the truck driver managed to escape from his cab. A security camera from a nearby business caught the accident on video and showed the Honda become airborne through the intersection and then land in a blast of sparks. The video also shows a few cars approach the scene and one person who came running on foot to the crash site to help the victims. "I saw like an explosion, so I came this way and saw it was a car crash," said the witness, Josue Morales. "I ran to the car and saw someone was in the car. I was trying to help, you know, but it was too smashed, so I couldn't do anything." The Honda driver was trapped inside his vehicle until firefighters arrived on the scene and worked to extract him from the wreckage. 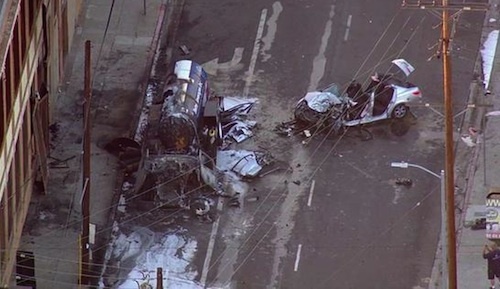 The driver was taken to the hospital in critical condition and his status on Monday was reported to still be in critical condition with life-threatening injuries. The truck driver was also taken to the hospital but was listed in fair condition and treated for back pain. The explosion caused a nearby building to catch fire but firefighters were able to get the fire under control before causing any interior damage. The intersection of Central Ave and East 16th Street was shut down on Monday as crews continued the difficult job of clearing the wreckage and investigators surveyed the scene. the link to the security camera video is highlighted in the article "caught the accident on video"
Too bad the wrong way driver survived. I really hate these idiots that do that. Why would you wish death on them? Because they are killing too many people out here on the roads including one of my family members who was killed by some stupid old man going the wrong way on a interstate. No they didn't as he didn't have any assets. And he had no insurance either. 4 wheelers are killing us. Thank goodness everyone is okay. Could have killed both drivers. Surely that truck driver had an Angel riding with him. These new trucks go up like a roman candle. Fumes from the fire itself are deadly. If your truck starts on fire please don't try and get anything out but yourself. And lord have mercy if you have a co-driver in the sleeper. All trucks should have an escape door in the sleeper for that exact reason. All b safe out there. It's the trucker's fault. Sarcasm.